Quilters know that there are so many wonderful quilts out there that we will not be able in one lifetime to make them all. 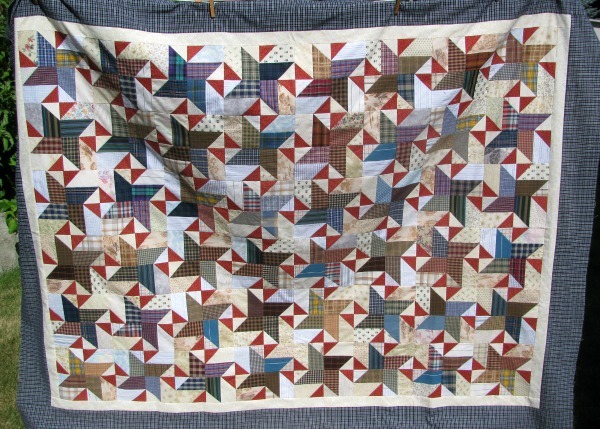 But even so, some quilts really are worth making a second time. Bonnie Hunter's Star Struck (find it among the free patterns at Quiltville.com) is one pattern I keep returning to. This summer I realized it was time to bring out the plaids once again and cut the pieces for more of those stars. This uses assorted plaids for the stars, assorted lights for the background stars, a constant red for the little hourglass units. I love the gentle look of the plaids, many of them from recycled shirts. I enjoy letting my eyes wander around the quilt to see how the various fabrics interact in the different combinations. A motley variety of background fabrics was used here, but even the busy ones seem to settle down and blend in with the others once it is all put together. This quilt will be donated to one of my favourite Good Causes. So classic! It's lovely with all the plaids.